Science, technology, engineering, and math (STEM) are a central focus of SAE Detroit Sections’ K-12 programs. 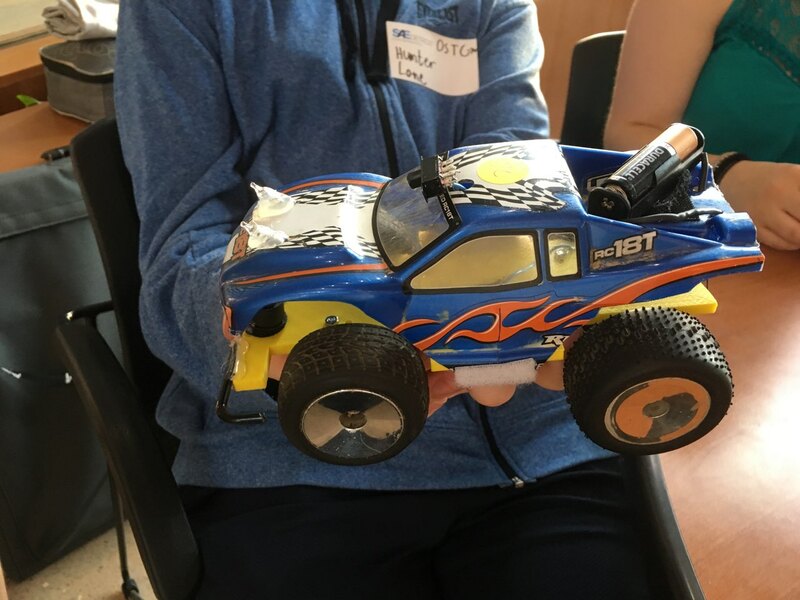 This year marks 26 years for this competition which provides an opportunity for students to build a mini-vehicle and compete with other schools for cash prizes. There are three award categories in the competition: Performance, Design, Overall Winning School, and Rookie. The Performance Competition is a multi-heat, double elimination head-to-head race. The Design Competition is based on a written paper and an oral presentation. The Overall Winning School Competition is based on accumulated total points per school from both the Performance and Design events. Teams must build a small vehicle to be powered by one AA alkaline battery capable of pulling a weighted trailer up a steep incline faster than the other competitors to advance. Teachers can prepare for this competition as an after-school activity or part of a classroom curriculum. NEW: For schools who have never participated in the competition. The school with the highest number of points in the Performance or Design category will with this award. The first 10 schools that register will receive a $100 travel stipend. Must be present to receive. Sponsored by Dana Incorporated, DENSO, and Yazaki North America, Inc.
Join us for this SAE Detroit Section exclusive tour, which normally is only open to GM employees, analysts, and the media. The GM Heritage Center is a showplace for the vehicles of the GM Heritage Collection, and the permanent home for the corporation’s collection of historic literature and artifacts. You will find this is a cross between the ultimate automotive enthusiast's garage and a living repository of automotive history. The GM North American Heritage Collection is made up of approximately 600 cars and trucks. Many reflect GM’s industry firsts, like the first production V8 that powered the 1915 Cadillac. You will see over a 100 displays on this tour. The center is always changing with vehicle exhibits constantly freshened to represent GM’s product story of the past 100+ years. By highlighting the exciting designs, groundbreaking technology, and powerful brands that have comprised GM’s first century, the GM Heritage Center will help inspire new generations of enthusiasts and make the company even stronger in years to come as GM moves toward its second century of operations. This is a great opportunity for SAE members to mentor a young professional, take advantage of the landscape, and experience the history. Important Note: This tour is limited to SAE members and their guests. Registration will close May 8. No onsite registration or refunds after May 8. Register before June 1 to receive discount! The day will begin with a networking breakfast followed by a shotgun start (scramble format) and end with a sit-down dinner. Fox Hills is proud to be a Certified Audubon Sanctuary golf course providing the best in course conditions while being dedicated to the care and preservation of the environment. The jewel of Fox Hills is the Golden Fox, an upscale links-style 18-hole championship course, designed by Arthur Hills. Reminiscent of the great Scottish seaside courses, it features prairie grasses, wetlands, steep bunkers, and large gently-undulating bent-grass greens. The golf outing is open to members and non-members. Each foursome leader will be notified by email approximately one week prior to the event with hole assignments and registration details. Space is limited. Golf fees include a golf cart, complete event scoring, hot breakfast, lunch on the turn, dinner, and awards banquet, and non-alcoholic beverages (cash bar for alcoholic beverages). Important Note: Registration will close July 16 (or when sold out). No onsite registration or refunds after July 12. Times are subject to change due to speed of golf. Please note, alcoholic beverages are neither supplied nor purchased by SAE Detroit Section. SAE advises attendees to drink responsibly and exercise good judgement at SAE events.